Posted on March 28, 2019 at 9:51 am. The teen years are defined by growth- your child is forming an identity that is separate from yours and building skills that will help guide them through the joys and challenges that lie ahead. As a parent, your job is changing, too. You may find yourself coaching from the sidelines more frequently, or even struggling with your new role. As the parent of an adopted teen, some of the complexities can feel harder to address. We are here to help you navigate the unique joys, experiences and issues faces by many adoptive families during the teen years so that you are prepared to navigate them head on. You’ve probably noticed some of the developmental changes in your adopted teenager. Things like hormonal changes, physical changes and emotional shifts that occur during the teenage years can impact how our teens relate to one another and to us. We know that many of these changes are developmentally normal for all children, regardless of their background. Brain development during the teen years also undergoes a unique shift that regulates behavior. For example, chemical changes in the pre-frontal cortex of teenage brains can encourage youth to seek out risky behaviors without considering consequences. These changes are not unique to adoptees. However; their early experiences and family structure is. How can we be mindful of our backgrounds during this time? Let’s start by considering our child’s early experiences and how they can impact physical, emotional and brain developmental during this stage. Did your adopted teen experience trauma as an infant or child? Being mindful of how traumatic experiences can impact emotional experience as a teenager and young adult can have a positive impact on your relationship today. Helping your adopted teen to understand that you are present, caring and supportive when they are expressing fear, anxiety or other difficult emotions is a useful way to remain connected to your child. It is also important to consider whether your child’s medical history may impact their development so that you can best assist them throughout adolescence. Teens with a history of prenatal alcohol and drug exposure may have different needs from family members, teachers and therapeutic support teams. During adolescence, your teenager is learning more about their own identity, what it means to them, and how they can use their identity to help guide them through the world. For adopted teens, their unique background is a crucial part of this identity formation. Teens begin to grapple with questions like “Who am I?”, “Where do I come from?”, “What do I want to become?” and they must learn how they are connected to, and different from their parents, siblings and communities as a whole. You might notice that your teen is beginning to connect more with friends than with you. You might also notice your teen is focusing more on things like his or her appearance or identifying with a particular music group during this time. These normal developmental processes are part of your teen’s expanding identity. For adopted teens, learning about identity can be more challenging because they have a more complex story. They may begin to ask more questions about their birth family, or their questions may be more complex. They may have an increased understanding of the complex concepts that touch some adoption stories, such as poverty or addiction, leading to more nuanced questions about their birth parents’ experience. Even if your teen has met members of their birth family, they may have new questions about their birth relatives that help them to understand their identity. Some teens may express interest in spending more time with birth relatives than they did during childhood- remember that this is a normal part of adolescence and supporting your teen during this time is an open demonstration of love and commitment to your family. As adoptive parents, it can be difficult to navigate adolescence as your teen begins to form this kind of independent identity. Remember that it is normal to feel sadness, anxiety and even anger when your child wants to learn more about their birth family or expresses a desire to spend more time with biological relatives. Processing these emotions fully and safely with the right kind of support is important so that you can continue supporting your adopted teen. In the same way you successfully parented your adopted child, successfully parenting your adopted teen comes with new challenges you can prepare for. Building a community of support for your family is a good way to ensure you have help when you need it. Reaching out for additional support through adoption competent therapists is another way to bolster your support system. If you’re still reading this, you probably know adoption needs to be a safe subject. Adopted teens think about their birth parents and adoption more than most parents realize. Finding ways to reassure your child that they can broach the subject of adoption with you is more important now than ever. We know that children whose parents talk about adoption from the very start have an easier time talking about adoption throughout their lives. If you think your teen has adoption on their mind, don’t wait for them to bring it up- raise the topic with them so they know you’re thinking about it, too. One way to introduce the topic is to share you’re thinking about their adoption or their birth parents’, and inviting your teen to add what they may be thinking about. Showing your child that talking about adoption is okay can help them understand that talking about their birth family and asking questions won’t hurt your feelings or offend you. Some adoptive parents struggle with what kind of information they should share with their adopted teen now that their child is older. Parts of their child’s adoption story that may be difficult or painful might seem tempting to conceal during your child’s teen years, especially if your adopted teen is dealing with other challenges. For example, if your child’s birth parent has a criminal history or dealt with substance abuse, it may be tempting to keep that part of the adoption story hidden. Consider that this may be the right time to share your child’s story so that he or she is able to understand their own identity fully, without imagining another version of the truth (that may be worse). This conversation can be intimidating for parents, and seeking the support of a professional adoption counselor can help you navigate discussing the complexities of your child’s adoption story so that it can be a positive, affirming part of your relationship. The teen years may not be the first time your child has expressed interest in their birth family. Or perhaps your child has never met his or her birth parents. But we all have a deep desire to understand our roots. 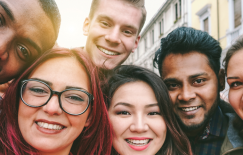 Many adopted teens feel a need to connect or reconnect with their birth family during adolescence. It is important to be prepared to navigate this contact thoughtfully. If your child’s adoption is open and you’ve maintained contact with birth family members, that’s great! Continue the conversation within the framework of your open adoption relationship so that your child knows they have support to continue building healthy relationships. Be mindful that your maturing child may have new questions that you can help them explore before reaching out to their birth family. An important reminder if your child has an open relationship with birth relatives during their teen years: be familiar with social media use. It has become increasingly common for adoptees to connect with birth family members through social media. When teens know the names and locations of birth relatives, connecting with them online is relatively simple. Continuing open, safe discussions about supporting your child’s ongoing connection with their birth family is one way to avoid surprise contact with birth relatives that can cause confusion for your child. If your child has never met their birth family, they may express a desire to do so during adolescence. This process is often referred to as “Search and Reunion”. One important thing to remember is that the “search” does not always go together with the “reunion”. If your adopted teen expresses a desire to learn more about their birth family for the first time, it’s important to listen to what they’d like to discover. Do they want to know the name of their birth parents? Find out where they were born? Discover more about their family tree? Or would they like to contact their birth family? Connecting with an adoption professional to begin the Search and Reunion process can be helpful in supporting your teen through this stage. Your role as a parent is to provide your child with the skills and tools they need to succeed. As an adoptive parent, providing your child with unique skills to face the world as an adoptee is equally important. During the teen years, it’s important for your child to feel secure as an adoptee. You can help your child feel more secure and confident in many ways. Prepare them to discuss adoption openly when it comes up in conversation. Help them to anticipate questions about your family, their background and to help their friends discuss adoption in ways that make them comfortable. Reassure your teen that they don’t have to share personal details, and that they are in charge of what information they would like to discuss about their adoption story. Teaching your teen that setting boundaries in discussions about adoptions is okay is a good way to show them they have autonomy. Finally, avoid using your child as an “example” for adoption in social interactions so that he or she understands adoption is a part of their story, not the defining characteristic. Reassure your child that it is okay to say “I don’t know” or “that’s not something I share about” if someone asks a question about adoption, and always ask before sharing part of their story with others. Want to Continue the Conversation? Join Us! Are you a teen adoptee? Parenting an adopted teen? Working with teen adoptees and their families? Join us for “Adoption and the Teen Years: A Conference for Teens, Parents and Professionals” on April 27th at the McLean School to help build your toolkit!